Personalized Torch Light Keychains Custom Printed in Bulk. Promotional, Inexpensive. Lowest prices in the USA and Canada for promotional torch key chains. Black or Brushed Silver, Translucent Blue, Red or Green. Wholesale Personalized Torch Light Keychain on sale. We also supply blank (not custom imprinted) bulk Torch Light Keychains at EQP (End Quantity Price). 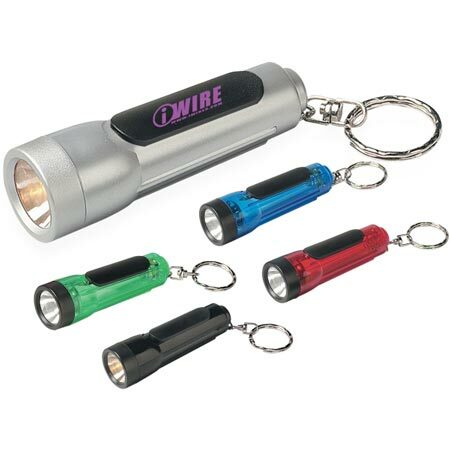 Lowest cost in USA and Canada for promotional Torch Light Keychains. American clients pay no taxes. Extra imprint color or location: not available. Colors: Solid: Black or Brushed Silver. Translucent: Blue, Red or Green, all with Black Trim. Packaging: Cello Bag, 500 per carton @ 28 lbs.